"I have always kept records of the size and species of fish that I have caught. 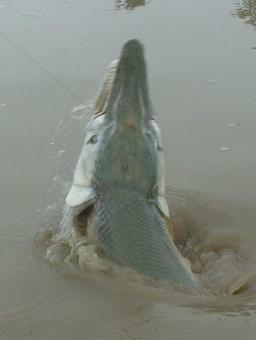 Until a few years ago I had a 0 in my book beside alligator gar. Dawson filled that for me many times over, plus I have also caught new personal best blue catfish, longnose gar, and common carp while fishing with Dawson. Dawson has the zeal and drive to succeed in this field. Give Dawson a call, he will set you p on the fish of your life." I truly enjoyed taking Mr. Kennedy fishing. If you have an interest in catching a trophy blue catfish, or several which is usually the case with Mr. Kennedy then I suggest checking out his site and giving him a call, he has been doing it for a long time and he really knows his stuff. You can contact him by clicking the above picture. "Don't let the boyish young looks fool you. Dawson Hefner is a seasoned gar fisherman who understands and constantly catches large gator gar. I've had the pleasure of fishing with him twice and both trips prove very successful and exciting. I'm most ready and will go with him again this spring." Dawson Hefner is the most dedicated angler that I know. His fish sense and knowledge of the freshwater ecosystem paired with his willingness to work hard, even to the point of hardship and suffering, makes him unique amongst guides. No one works as hard to find new honey holes like Dawson. He is the first Texas angler that I have met that is as obsessed with catching mega sized Texas giants as I am. I have learned as much about alligator gar fishing from him as he has learned about buffalo fishing from me. I am honored to pass on the buffalo torch to Dawson. I can not thank Jason enough for the invaluable in formation he has shared with me about smallmouth buffalo. He has shared the best of what has taken him literally thousands of hours to obtain with me, and I will in turn put that information together with what I have learned over the years to insure you have an angling experience like no other. "For years I dreamed about catching a large alligator gar on rod and reel, but had no idea were to start. After stumbling across Dawson online he made this dream come true. Several times in the same day! I could spend weeks with Dawson and not soak up enough of his wit and gator gar knowledge. What a guy, and fishing experince! I canot wait untill the next trip"